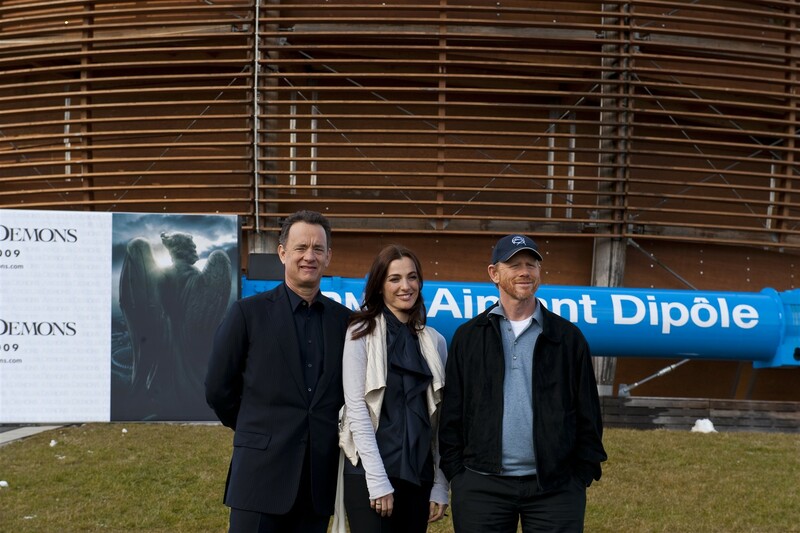 On 12 February CERN hosted a visit from actors Tom Hanks and Ayelet Zurer and director Ron Howard as they unveiled some exclusive footage from their new film adaptation of Dan Brown’s novel Angels and Demons. The stars of Angels and Demons, Tom Hanks and Ayelet Zurer, outside the Globe, together with director Ron Howard. The actors with their antimatter counterparts. In front, Tara Shears, physicist from LHCb and the actress Ayelet Zurer. Behind them Tom Hanks and Rolf Landua, one of CERN’s antimatter experts. On either side, Sergio Bertolucci, Director for Research, and Ron Howard, film director. One of CERN’s leading physicists has been murdered and his body dismembered in order to gain access to the highly restricted ‘antimatter factory’…. Don’t worry: CERN’s staff, and antimatter, are perfectly safe; this is simply the plot of the new film adaptation of Dan Brown’s novel Angels and Demons. 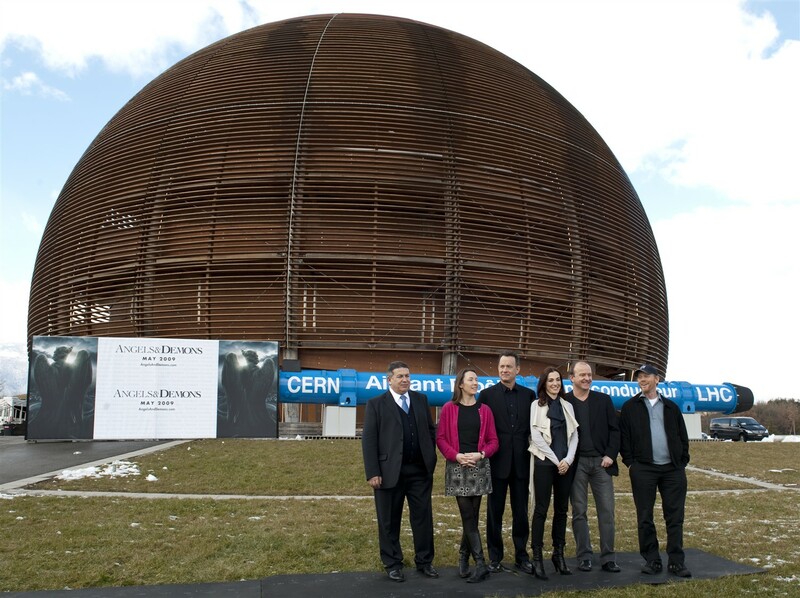 On 12 February the stars of the film, Tom Hanks and Ayelet Zurer, and director Ron Howard came to CERN to promote their new movie. In the evening they attended a press conference in the Globe, where an exclusive 10-minute preview of the new film was screened. A short scene in the film was shot in the ATLAS cavern and while at CERN the stars took the opportunity to visit the cavern and to learn about the physics happening at CERN. "It’s quite unusual for CERN to be colliding with Hollywood," joked CERN Research Director Sergio Bertolucci as he introduced the press conference to over 100 journalists from around the world. "But collisions are what we do, so we will have to get on with it." "It’s been a privilege working with CERN," said director Ron Howard, wearing his new CERN baseball cap. "The scientists here have been incredibly helpful in explaining the science to us, and giving us access to some incredible places. I think what they’re doing here is fantastic." The film is a prequel to the hugely popular DaVinci Code and Tom Hanks resumes his role as Harvard symbologist Robert Langdon, who once again finds that forces with ancient roots are willing to stop at nothing to advance their goals. The plot follows the murder of one of CERN’s leading antimatter experts, and a ‘canister’ of antimatter is stolen to create a bomb. One of CERN’s real-life antimatter experts, Rolf Landua, former spokesman of the ATHENA antihydrogen experiment, was at the press conference to field questions regarding the science behind the film. "Dan Brown was exactly right in saying that antimatter and matter create an awful lot of energy if they come into contact. If you had enough antimatter – a gram, like in the movie, well I certainly wouldn’t want to be near it," Landua explained. In reality, of course, CERN cannot create such quantities of antimatter. In fact, if you somehow managed to contain all the antimatter CERN has ever created and annihilate it with matter it would only be able to light a lightbulb for a few minutes. While at CERN all of the stars showed a very keen interest in the real antimatter research being done. During the visit Steve Myers, Director for Accelerators and Technology, even invited Tom Hanks to come back and turn on the LHC this September. Ayelet Zurer also enjoyed her tour of the Laboratory. "I’ve never seen her quite as happy as she was today, getting a tour of CERN," said Howard later at the press conference. "It was fantastic," agreed Zurer, "like seeing a spaceship before it’s launched – the first steps into the unknown."